CALGARY, AB --(Marketwired - January 18, 2017) - Kelt Exploration Ltd. (TSX: KEL) ("Kelt" or the "Company") has completed its previously announced disposition of oil and gas assets in the Karr area of Alberta. The effective adjustment date of the disposition was January 1, 2017. Kelt received gross proceeds, prior to adjustments at closing, in the amount of $100.0 million, including $6.2 million which is being held in escrow subject to certain preferential rights. Funds in the amount of $6.2 million will be paid to Kelt after satisfaction of the preferential rights. The Company's syndicate of lenders has confirmed that the authorized borrowing amount available under its credit facility remains unchanged at $185.0 million. Bank debt, net of working capital, is estimated to be $52.0 million as at December 31, 2017 or 0.4 times forecasted 2017 funds from operations of $128.0 million. In the second half of 2014, global crude oil prices began a precipitous decline that resulted in massive cutbacks in capital spending on energy projects worldwide. After averaging US$93.00 per barrel in 2014, WTI oil prices averaged US$48.80 per barrel in 2015 and bottomed with a low average price of US$33.45 per barrel during the first quarter of 2016. In November 2016, OPEC and certain non-OPEC countries agreed to cut oil production supplies, resulting in a recovery of oil prices, currently above US$50.00 per barrel. 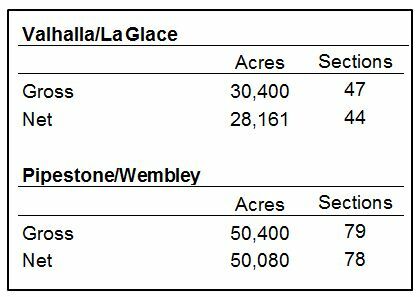 Kelt has accumulated and currently holds 50,080 net acres (78 sections) of land with Montney rights in a new core exploration area at Pipestone/Wembley, Alberta, adjacent to its Valhalla/La Glace assets (see Figure 2). Kelt expects to drill its first exploration Montney horizontal well located at Oak 02/06-02-086-18W6 (bottom hole) in the first quarter of 2017. The well will be drilled adjacent to two vertical wells that are approximately two miles apart, both of which tested gas and condensate during short well test periods. 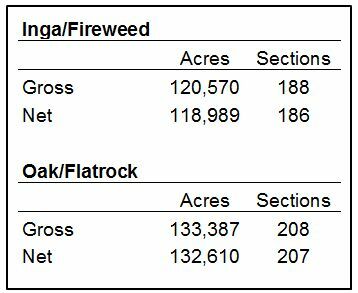 Gas composition from an existing analysis at Oak appears to be similar to the Company's gas analysis at Inga/Fireweed. 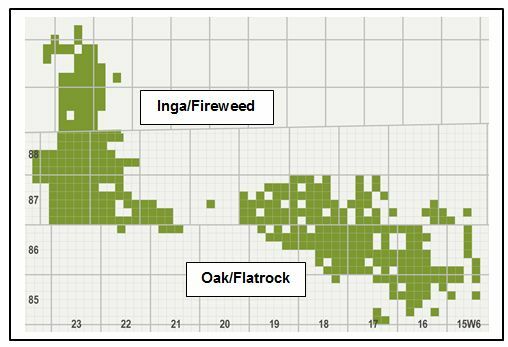 Offsetting reservoir pressures at Oak indicate a gradient of approximately 9.8 kPa per metre. Kelt expects to drill a second exploration horizontal Montney well on the eastern part of its land block during the second half of 2017. Kelt established its original Montney core position at Valhalla/La Glace and Pipestone/Wembley through certain acquisitions completed in 2013 and 2014. Prior to the commodity price downturn, the Company held 38,513 net acres (60 sections) of lands with Montney rights. Through an active land acquisition strategy during 2015 and 2016, primarily through Crown land sales, Kelt has expanded its Montney land holdings in the area to 78,241 net acres (122 sections), an increase of 103%. Competitor drilling adjacent to newly acquired Kelt acreage has resulted in prolific well results from the Montney formation. The Company expects to move a rig to Valhalla/La Glace during the third week of January where Kelt will drill two wells in the middle Montney. 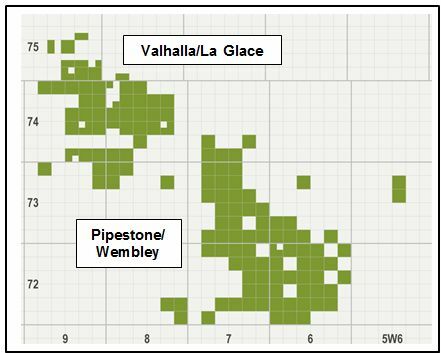 Upon rig release of the two Valhalla/La Glace wells, the Company expects to drill its first exploration well at Pipestone/Wembley in the first half of 2017. The Company plans to spend $144.6 million on capital projects in 2017, of which approximately 72% will be incurred on drilling and completing wells. Approximately $58.0 million (40% of total budget) is expected to be incurred in the first quarter of 2017. Kelt is forecasting funds from operations for 2017 to be approximately $128.0 million (based on an average WTI oil price of US$52.00 per barrel and an average AECO natural gas price of $2.95/GJ). Bank debt, net of working capital, is estimated to be $52.0 million as at December 31, 2017 or 0.4 times forecasted 2017 funds from operations. In BC, Kelt has completed the recently drilled upper Montney well at Fireweed located at C-31-I/94-A-12 in the previously un-tested northeast part of its large contiguous Montney land block. This well was completed using slick-water comprising 46 frac stages with average proppant of 70 tonnes per stage and average fluid pump rates of 10.3 cubic metres per minute. The well is currently being tested and the initial results appear very favourable. Kelt is currently drilling an upper Montney well in the previously un-tested southeast part of its BC Montney land block at Inga, located at 8-17-87-22W6. The Company expects to rig release this well by the end of January and commence completion operations in February. Upon completion of this well, Kelt expects to initiate a development drilling program in the upper Montney at Inga by switching to multi-well pad drilling, currently planned for the second half of 2017. At Pouce Coupe, Alberta, completion operations are underway on the five-well pad where two wells were drilled in the lower-middle Montney ("D1") and three wells were drilled in the upper-middle Montney ("D2"). Four wells have been completed and will commence flow back during the next week. The fifth well, along with another well that is currently drilling on the western land block at Pouce Coupe, are expected to be completed later in the first quarter using recycled water obtained from flow back of the first four wells. At Progress, Alberta, Kelt has commenced drilling the first well of a two well program. These wells are expected to be completed in March 2017. To date, results from the Progress Montney play are demonstrating similar characteristics to the Pouce Coupe/Gordondale Montney B pool, which Kelt used as an analogy prior to acquiring its Progress acreage position. During the commodity price downturn, Kelt acquired 43 gross (29 net) sections of land with Montney rights at Progress. At spring break-up, the Company will re-evaluate its spending plans for the remainder of 2017. With continued improvement in oil and gas prices, Kelt will consider increasing its capital program for the balance of 2017 at that time. This press release contains forward-looking statements and forward-looking information within the meaning of applicable securities laws. The use of any of the words "expect", "anticipate", "continue", "estimate", "objective", "ongoing", "may", "will", "project", "should", "believe", "plans", "intends" and similar expressions are intended to identify forward-looking information or statements. In particular, this press release contains forward-looking statements pertaining to the following: the expected payment of $6.2 million to Kelt upon satisfaction of preferential rights; the expected timing of drilling and completion operations; and the Company's expected future financial position and operating results, as well as the amount and timing of future capital expenditures. Statements relating to "reserves" or "resources" are deemed to be forward looking statements, as they involve the implied assessment, based on certain estimates and assumptions, that the reserves described exist in the quantities predicted or estimated and that the reserves can be profitably produced in the future. Certain information set out herein may be considered as "financial outlook" within the meaning of applicable securities laws. The purpose of this financial outlook is to provide readers with disclosure regarding Kelt's reasonable expectations as to the anticipated results of its proposed business activities for 2017. Readers are cautioned that the financial outlook may not be appropriate for other purposes. This press release contains certain financial measures, as described below, which do not have standardized meanings prescribed by GAAP. As these measures are commonly used in the oil and gas industry, the Company believes that their inclusion is useful to investors. The reader is cautioned that these amounts may not be directly comparable to measures for other companies where similar terminology is used. "Operating income" is calculated by deducting royalties, production expenses and transportation expenses from oil and gas revenue, after realized gains or losses on associated financial instruments. The Company refers to operating income expressed per unit of production as an "Operating netback". "Funds from operations" is calculated by adding back transaction costs associated with acquisitions and dispositions, provisions for potential credit losses, settlement of decommissioning obligations and the change in non-cash operating working capital to cash provided by operating activities. Funds from operations per common share is calculated on a consistent basis with profit (loss) per common share, using basic and diluted weighted average common shares as determined in accordance with GAAP. Funds from operations and operating income or netbacks are used by Kelt as key measures of performance and are not intended to represent operating profits nor should they be viewed as an alternative to cash provided by operating activities, profit or other measures of financial performance calculated in accordance with GAAP. The term "net bank debt" is used synonymously with, and is equal to, "bank debt, net of working capital". "Net bank debt" is calculated by adding the working capital deficiency to bank debt. The working capital deficiency is equal to total current assets net of total current liabilities, excluding the current portion of bank debt. The Company uses a "net bank debt to trailing funds from operations ratio" as a benchmark on which management monitors the Company's capital structure and short-term financing requirements. All dollar amounts are referenced in thousands of Canadian dollars, except when noted otherwise. This press release contains various references to the abbreviation BOE which means barrels of oil equivalent. Where amounts are expressed on a BOE basis, natural gas volumes have been converted to oil equivalence at six thousand cubic feet per barrel and sulphur volumes have been converted to oil equivalence at 0.6 long tons per barrel. The term BOE may be misleading, particularly if used in isolation. A BOE conversion ratio of six thousand cubic feet per barrel is based on an energy equivalency conversion method primarily applicable at the burner tip and does not represent a value equivalency at the wellhead and is significantly different than the value ratio based on the current price of crude oil and natural gas. This conversion factor is an industry accepted norm and is not based on either energy content or current prices. References to oil in this press release include crude oil and field condensate. References to natural gas liquids ("NGLs") include pentane, butane, propane, and ethane. References to gas in this press release include natural gas and sulphur. Such abbreviation may be misleading, particularly if used in isolation.